Many Americans were pleasantly surprised to see that their take-home pay had gone up at the start of 2018, a result of the Tax Cuts and Jobs Act that took effect on January 1, 2018. But preparing the 2018 taxes may bring a less pleasant surprise for millions of Americans who assumed they could keep the extra money in their paychecks. A lot of people really believe the money they’re taking home is theirs to keep, but you won’t be absolutely sure until you see your 2018 return ... I’m telling everyone the same thing: Don’t count your chickens. On paper, the new withholding tables introduced by the Tax Cuts and Jobs Act brought about an overall reduction in taxes for many individuals. Tax brackets were compressed, and the standard deduction for a single-filer went from $6,350 to $12,000. The problem is that the new withholding tables don’t reflect the elimination of certain deductions that many people had come to depend on. For example, in 2018 the personal exemption—which reduced an individual’s taxable income by $4,050—will no longer be allowed as a deduction. Nor will the interest on home equity loans, unless the loan is specifically being used to improve the home. Additionally, the deduction for state and local sales, income, and property taxes have been capped at $10,000, and the standard personal deduction for children is also no longer available in its past form. What’s happening now is a unique thing that hasn't really happened before. The IRS could only create one set of withholding tables for everyone, so someone who is single and retired in Florida is using the same tables as someone who is married with six kids in New York. It’s just not going to work for everyone. You live in a state with high property taxes. For residents of New Jersey, Illinois, New Hampshire, California, New York, and Connecticut, the $10,000 cap on state and local sales, income, and property taxes are especially problematic. In New Jersey, which has a 2.4 percent property tax rate, a $500,000 home would carry a $12,000 annual bill, while a home worth $2 million would be hit with a $48,000 bill. You can’t deduct all of that anymore. You’re a single parent. Instead of the $4,050-per-child personal exemption, a $2,000-per-child refundable credit will be the new standard in 2018. Generally, credits, which reduce your overall tax bill rather than reducing the amount of your taxable income, are preferable to deductions. But again, there’s a cap: The credit isn’t available to individuals with income over $240,000 or married couples with income over $440,000. While some taxpayers may come out on top with the credit, single parents may have done better with the deduction. There’s no ‘Oh, I thought the new law was going to be better’ exemption. If you come up short, you’re going to get hit with a penalty. If you’re trying to estimate your quarterly taxes for 2018, you can avoid a penalty by basing your payments on 2017’s actual figures. If you know your 2018 income is going to be higher, set some additional money aside, Slott advises. You claim non-reimbursable work expenses or investment management fees. Both of those deductions are gone for the next filing year. If any of these situations describe you, then don’t get too attached to all that extra money in your paychecks. Indeed, it may be worth setting some of those earnings aside, in case these new deduction rules change your usual refund into a hefty tax bill. On the other hand, many taxpayers will get to hold onto their increased earnings, and may even be in for a larger refund than usual. If you fall into the following categories, you’ve probably got nothing to worry about come tax season. You’re a senior without many deductions. If you don’t have dependent children, have paid off your mortgage (or home equity loan), or retired to a state with lower property taxes, you’re in luck. The new standard deduction of $12,000 for singles and $24,000 for married couples filing jointly will likely benefit you. “[These] people will be able to keep the additional money they’re seeing, and may get some back as a refund,” Slott explains. 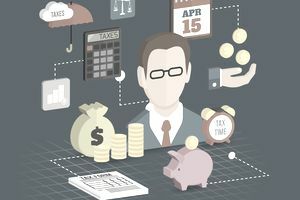 Any business owner of an LLC, S-Corp, or sole proprietorship is potentially going to be able to take this 20 percent deduction on their business income to reduce their taxable income. It’s really going to be a boon for a lot of people and opens the door for a lot of planning opportunities. Don’t spend that extra money. You may owe it all back and then some. It’s much better to get a check back for $5 than it is to owe $1,000.